Two-photon intravital imaging (2P-IVM) of the murine trachea is a powerful technique for real-time imaging of immune cell recruitment and trafficking during airborne pathogen infections. Neutrophils are an important component of the innate immune response that are able to rapidly infiltrate the airway mucosa in response to Streptococcus pneumoniae infection. Here we describe a protocol to visualize in vivo neutrophil extravasation and cell dynamics in the tracheal tissue of a S. pneumoniae-infected mouse using 2P-IVM. To perform this protocol, we infected and imaged the trachea of a lysozyme M green fluorescent protein (LysM-GFP) mouse, in which neutrophils express GFP. Additionally, we used a custom-designed platform, which allowed the intubation and fixation of the trachea after surgical exposition, and we injected intravenously a fluorescently labeled dextran solution to visualize the blood vessels. The online version of this chapter ( https://doi.org/10.1007/978-1-4939-9199-0_15) contains supplementary material, which is available to authorized users. This work was supported by the Swiss National Foundation (SNF) grants 176124, 145038 (R’equipt) and 148183 (Ambizione), and the European Commission Marie Curie Reintegration Grant 612742. Authors Contributions. S.F.G. directed the study; S.F.G. and M.P.-S designed and performed experiments, analyzed and interpreted the results, and wrote the manuscript. 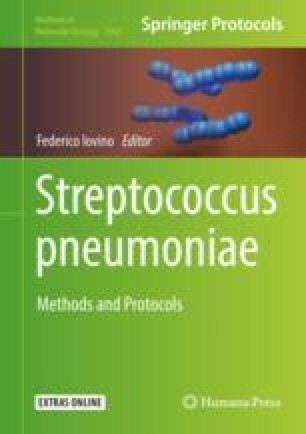 In vivo imaging of neutrophil recruitment after S. pneumoniae infection. (First part) 30 min time-lapse 3D image showing the dynamics of neutrophils (green, small and motile) and macrophages (green, large and immobile), SHG signal from fibrillary collagen (blue) and blood vessels (red) in trachea at day 1 p.i.. (Second part) magnified representative sequence showing neutrophil extravasation from the blood vessels into the tracheal tissue during S. pneumoniae infection. Scale bar represents 50 μm (MP4 41466 kb).